The BriteVue Sensor Loupe™ 7X is designed to provide a more in depth view of the sensor and chamber area. It has the ability to reveal the smallest dust particles and any other contaminants on the sensor. Utilizing BriteVue technology with high optical magnification and 6 super bright LEDs, the SensorLoupe™ 7X is the only tool you need for locating debris on your sensor. The high quality optical glass is coated with MgF2 to reduce chromatic aberrations and to seal the lens so that no mildew buildup occurs. The high caliber materials used in construction of the SensorLoupe™ provide a high resolution, distortion free, crystal clear image of the sensor. The BriteVue design aids to easily spot dust on the sensor, succeeding where other tools fail. 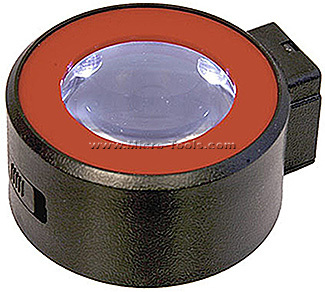 The angled configuration of the 6 intensely lit LEDs, similar to that used in satellite imaging, provides a three dimensional image of the debris as opposed to linear lights of ordinary Loupes on the market. The SensorLoupe™ 7X from Visible Dust makes it easier then ever before in locating even the smallest dust speck without resorting to time consuming inspection through a computer monitor.